Vegas is one of those places: either you love it or hate it. I think I hate to love it, versus loving to hate it. I don’t like the endless commotion, bustle, and noise but appreciate the “shock value” in the way it offers a one of a kind experience. If you haven’t been but are planning to go, I suggest you consider a few of these classic, “touristy” yet very worthwhile Vegas experiences. 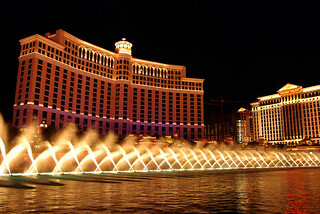 Every fifteen minutes like clockwork the Bellagio fountains come to life and do their song and dance. It’s an impressive show, stretching on for what seems like several blocks. It’s nice during the day but I’d suggest you spend your afternoon in the Bellagio’s flower gardens, then come back after dark – at night time the fountains really come alive. 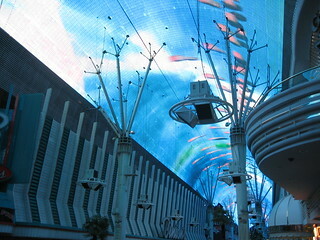 Those aren’t my words – they really do call this the Fremont Street Experience. The whole street is covered with LED displays that light up and do a number of different “shows” (for lack of a better word). This is where some of Vegas’s older casinos are, which to me have a nicer and more traditional feel, which is kind of fun. Lots of great photo opportunities here as well. There are lots of Vegas shows, including some free ones. And no doubt your hotel will try to offer some great value tickets for a show, or perhaps it will be included in your package. But the only performers that have stood out in my mind above the rest are Cirque du Soleil. The troupe has several regular shows in Vegas and their combination of stage presence, costumes and incredible acrobat techniques is impressive. Best to try to get reservations well in advance of travel for the show of your choice. It’s Vegas, right? You have to gamble at least something – and don’t worry, from the moment you walk off the plane until the door in your hotel room closes behind you, there will be a slot machine nearby. I think you even hear them in your sleep, they really are everywhere. 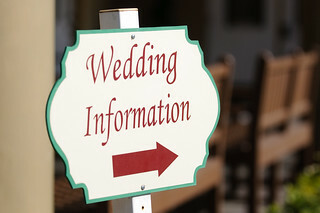 What happens in Vegas stays in Vegas, they say, though in this case if you choose to purchase the $60 marriage license, your wedding will be recognised in all fifty states. It is terribly easy to get married in Las Vegas, and they definitely want to make it easy for you, with the government office issuing licenses open until midnight and chapels open nearly 24×7, so that stuff you seen happening on film could easily be a reality. The Stratosphere is the tallest building in Las Vegas and incredibly the 5th tallest building in the United States. So it’s the perfect place to be strapped into a seat and be rocketed around the edge of the building, rocking back and forth along a track called the X-Scream, designed to ensure you do exactly that – scream. If that wasn’t enough, there are plenty of other opportunities to be terrified, including the “Big Shot” ride – tallest thrill ride in the world – as well as Insanity, which as the name implies, is an intense ride. And if you can’t take it anymore, then jump off – courtesy of the folks at Skyjump, with their bungee jump simulator. You’re strapped into a jump suit and leap off, where guide wires connected to a “decelerator” insure your safe landing. Only in Vegas.